Luc Botta lives in Nice and started playing the guitar at the age of eight. French masters were Alexandre Lagoya and Alberto Ponce. He benefited from their teaching and now leads, in parallel a career of concert and teacher of conservatory. 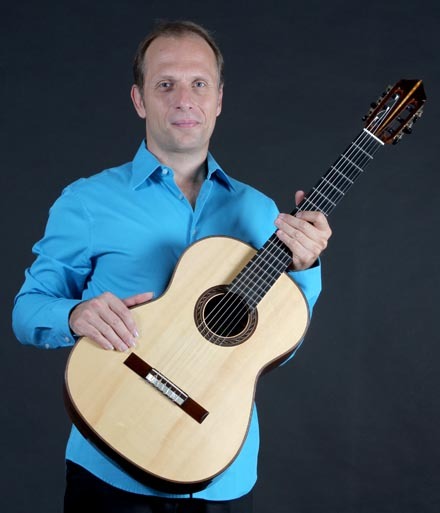 He won a gold medal unanimously at Toulon's conservatory and has a master grade of classical guitar. He gave himself in concert solo and with many formations, as the Sinfonietta of Lyon or the orchestra of Cannes, and so in chamber music for four guitars in particular. He also has a solid experience in other styles of music like jazz. He favours now a solo repertory, in which his playing, very recognizable and sensitive can be showed freely. Charmed by it's roundness, it's power, it's ease and it's reliability, Luc Botta only plays on a Kenny Hill Signature, since 2010. Luc plays a 2010 Hill Signature Guitar.